Nauru, an Island nation in Micronesia in the South Pacific has a total land area of 8.1 square miles and a population of around 14,000. Nauru, the world's smallest island nation, is a phosphate rock island. The earlier source of revenue was phosphate mining and when that diminished Nauru tried its luck as a tax haven and illegal money laundering center. Internet based banking and tourism are emerging sectors. Countries Less Traveled Nauru DVD B002L2SD40 $15 30 minutes. Depicts present-day Nauru, a bankrupt nation which was at one point the second richest on earth. Paradise for Sale: A Parable of Nature 978-0520222298 $19 Depicts the grim history of Nauru Island that started with the discovery of phosphate. Presents a case of free-market economy being in direct conflict with sustaining the environment. The first stamps of Nauru were a set of eleven stamps released between 1916 and 1923 showing a portrait of King George V (KGV). They were ‘Nauru’ overprints on Great Britain stamps of 1912-13. The set (Scott #1 to #12) catalogs for around $95 mint and around double that for used. Another overprint on British Scott #179 was also issued during the period. That set (Scott #13 to #15) is even more valuable and catalogs for around $500 mint and around $600 for used. 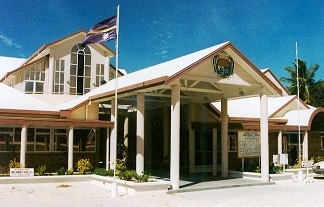 Before World War I, Nauru was a colony of the German Empire. It was administered by Australia, New Zealand, and the UK following a League of Nations mandate in 1919. It came under Japanese occupation during World War II and entered into trusteeship again after Japanese defeat. Nauru was declared independent in 1968. The first original issues of Nauru were a long running set of fourteen stamps released between 1924 and 1947. The set (Scott #17 to #30a) catalogs for around $150 mint and around $260 used. The design shows a freighter. Certain varieties are extremely valuable and sought after. They include imperforated between horizontal and vertical pairs of Scott #21a that catalog for around $4.5K. A set of eight stamps released between 1963 and 1965 showing Flora and Fauna. The set (Scott #49 to #56) catalogs for around $20 MNH and around $14 used. The designs show Micronesian pigeon, poison nut flower, balsam, black lizard, capparis, white tern, coral pinnacles, and nightingale reed warbler. A long set of seventeen stamps released between 1978 and 1979 showing local scenes. The set (Scott #165 to #181) catalogs for around $17 MNH and around $15 used. The designs show fisherman and family collecting shellfish, pigs foraging near coral reef, gnarled tree and birds, girl catching fish with hands, bird catching fish, girls catching fish in Buada Lagoon, Ljuw Lagoon, young girl and corral formation, reef pinnacles at Anibare Bay, pinnacles at Meneng shore, frigate bird, coconut palm and noddies, lwiyi, wading bird, frigate birds, pinnacles at Topside, newly uncovered pinnacles at Topside, and old pinnacles at Topside. Nauru lacks natural resources and its economy peaked in the early 80s when it depended entirely on phosphate deposits that originated from the droppings of sea birds. A set of twelve stamps released on July 15, 1991 in the Flowers theme. The set (Scott #380 to #392) catalogs for around $14 MNH and around the same for used. The designs show oleander, lily, passion flower, different lily, casealpinia, clerodendron, Bauhina pinnata, hibiscus, apocynaceae, bindweed, tristellateia, and Impala lily. A set of six stamps and a souvenir sheet of two stamps released on March 29, 2005 to mark the Bicentenary of the Battle of Trafalgar. The set (Scott #523 to #528 and #529a-b) catalogs for around $18 MNH or used. The designs show Aigle in action against HMS Defiance, French Eprouvette, Santissima Trinidad in action against HMS Africa, Emperor Napoleon Bonaparte, HMS Victory, Vice-Admiral Sir Horatio Nelson, Admiral Pierre Villevenueve, and Formidable. The first issue of Nauru was a Republic Decimal Coinage (100 cents = 1 Australian Dollar) 10 Dollars Silver Proof showing National Arms in Obverse and Value and Ingot in Reverse. It was issued to mark the Silver Jubilee of Independence. Since then, a number of commemorative gold and silver proofs have been issued and they are valued at a slight premium over bullion value.